Near Rome and the Via Salaria, one of the roads paved by the Romans, you will find this beautiful estate in the midst of the Marcigliana nature park. It is an ideal basis for visiting Rome because you are there within a half an hour. The estate consists of an old farm with 5 holiday apartments and 10 hectares of land, and has been around since the end of the 19th century. There is also a horse breeding farm and stables on the property. In the other building on the property, weddings and parties can be organized. If there are weddings or parties going on on the property, the swimming pool cannot be used by the guests. Apartment Azzurra is charming, light and atmospherically furnished with beautiful furniture. In addition, there is a tennis court, a swimming pool and a spacious communal garden for the guests. This apartment is the closest country resort to Rome centre, at only 20 km from Rome centre (and the Vatican), with different ways to go to Rome city: by car, bus, by metropolitan train. It is located in the north-east part of Rome city and Bracciano, Tivoli, Sabina are easily reachable in 20 minutes. 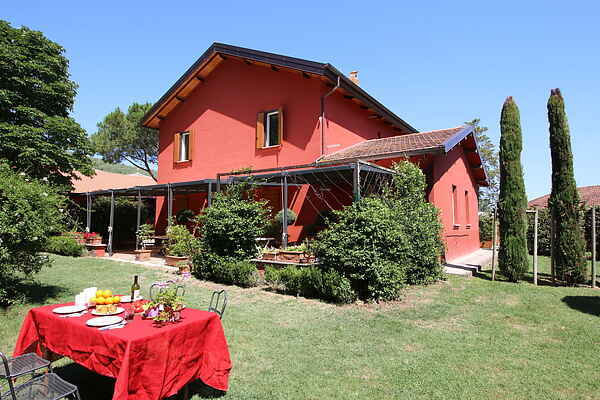 At the country resort can you go horse riding, you can use the swimming pool and tennis court In the neighborhood are different good restaurants like Ristorante La Villetta and Pizzeria 7 Archi.